audit function refers to independent assessment and objective assurance designed to add value and improve TOs’ compliance with the Sharīʿah. More recently, the Islamic Financial Services Act (IFSA 2013) includes a provision for the Sharīʿah audit function and requires each institution to appoint a person, subject to approval of the appointment by BNM, to conduct an audit on Sharīʿah compliance. In order for TOs to assess whether sound and effective internal controls have been implemented, a comprehensive internal audit plan must be developed. To achieve this and move forward, TOs need a handbook that serves as a concise reference providing basic information such as audit areas, their Sharīʿah and regulatory justifications, nature and levels of risk involved. 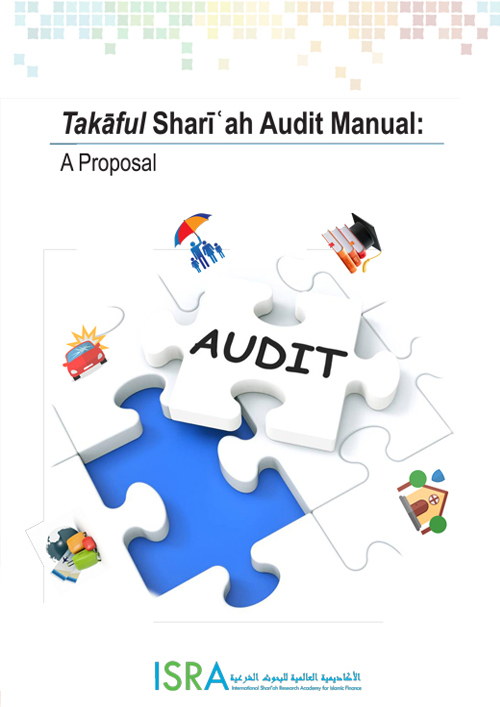 This manual is a response to this requirement based on a collaborative effort between the International Shari’ah Research Academy for Islamic Finance (ISRA) and Malaysian Takaful Association (MTA). The introductory part explains the main purpose of this manual, highlights the essence of Sharīʿah compliance, and outlines Sharīʿah non-compliance events. It also outlines the scope and limitations of the Sharīʿah audit manual as well as its legal proviso, rationale, audit approaches and the relevant Sharīʿah principles and standards. Part A on takāful audit scope applies a business-perspective approach focusing on auditable areas outlined in BNM’s guidelines on the takāful operational framework. In addition to these audit areas, the manual applies a value-based approach by adding Sharīʿah governance, human resources, Sharīʿah non-compliant income and other miscellaneous financial issues to the audit areas to ensure the audit is comprehensive enough to further strengthen the internal control system for Sharīʿah compliance. Part B on the Sharīʿah and regulatory bases presents the objectives of each audit area and the references for them from both primary and secondary Sharīʿah sources. It also presents regulations and guiding principles that provide adequate grounds for the audit areas highlighted in Part A. Further, it also provides readers with the levels of risk involved. The determination of these risks and their levels depends largely on the assessment of the impact of Sharīʿah non-compliant events. Part C is an internal control questionnaire that outlines relevant questions for consideration in the process of internal Sharīʿah audit. Keywords: Sharīʿah audit, audit areas, internal control, takāful operators (TOs).